The main difference between Cement siding and Cedar siding is watershed versus waterproof. Cement siding will watershed, which means that it needs to be channeled and directed. Without proper flashing and caulking, water will seep in, swell, freeze and cause damage. Real Western Red Cedar is more waterproof. Water can absorb into the wood, but it will not be damaged from freezing or swelling. The natural choice wins with less installation labor and less risk of damage. If you want your siding to look like cedar, why not just buy cedar? The fact is, a lot of people fall for the gimmicks and then end up wanting real cedar in the long run. Search the web and you'll find articles like this that teach you How to paint your Hardie board siding to look like cedar siding. Patching compound, Sandpaper and two different colors of paint to mix? Do yourself a favor and buy real cedar. You'll save yourself a lot of time, headache and even some money! Why pay more just to re-paint your siding? Read more about the class action lawsuit against James Hardie cement siding here. Read more about the CertainTeed Fiber Cement Siding issues here. Natural Cedar, there really is no substitute. 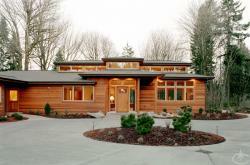 It is natural, recyclable and the beauty of Western Red Cedar can not be beat.